With is vast array of sun drenched locations and dream-sequence beaches the islands of the Caribbean are growing in popularity as destimations for 'tying the knot'. It helps that the Caribbean as it is an area where the weather is 'almost' guaranteed all year round and it certainly beats standing forlornly in the drizzle or snow whilst your wedding photographer fiddles with his/her lenses and light-exposure settings (as in the UK and elsewhere further north of the DR) if you have chosen to wed outside of the summer months! The exotic locations on offer for Caribbean weddings also ensure that your special day will linger in your memeory and that of your friends and family for many years to come! 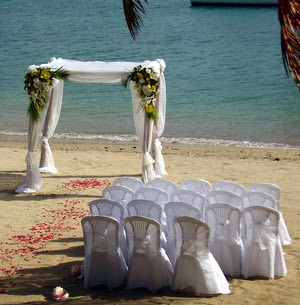 Whilst we are necessarily biased to suggest that the ideal place for your perfect nuptial ceremony can be planned and experienced on the wonderful isle of La Hispanola -- otherwise known as the Dominican Republic -- there are a number of places you might want to compare before you return to 'clinch' that best deal and make yours one of the coming years' Caribbean weddings to remember. 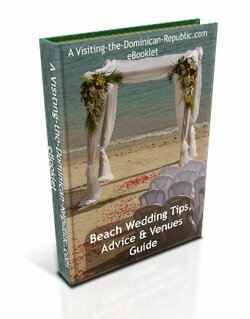 Tips for becoming a happy Dominican Bride and avoiding the pitfalls of marrying far from home and familiar surroundings!